Kathy E Gill | A year in the life of a Twitter account - Educator, WebUX, Writer. Rabble-rouser. 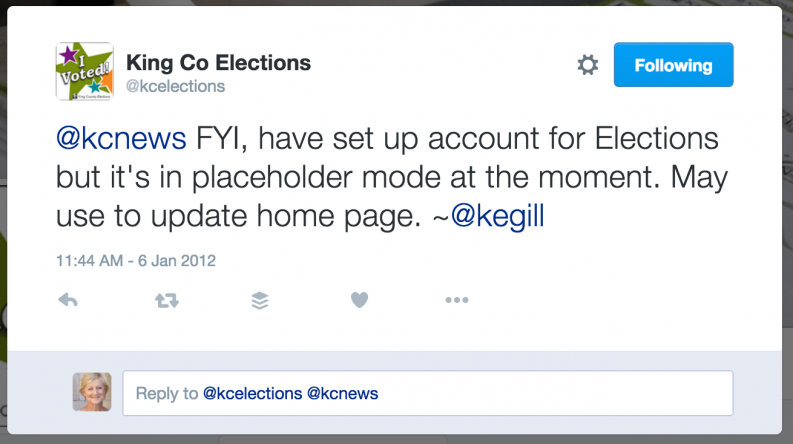 King County Elections had a limited social media presence when I joined the communications team in late 2011. One of the first things that I did was to set up a Twitter account. Although my title was webmaster, I was our digital communication specialist. The first year, we developed a pattern with Twitter that complemented our other communication outreach. Over time, we’ve added more video and photos, like every other organizational Twitter account. But the core messaging — and purpose — is unchanged. Here’s the story. On Storify.